Many years ago, a group of bold adventurers travelled from North Africa to the Middle East. They were the first people of their species to leave the continent in which the human race had evolved, and those who followed in their footsteps eventually spread throughout the world to form the cultures and nations we know today. But when did this initial departure from Africa take place? A new study, led by Prof. Israel Hershkovitz from Tel-Aviv University’s Medical School and Prof. Mina Weinstein-Evron from the Archeology Department at the University of Haifa, suggests that the answer is: much earlier than we previously thought. The most ancient evidence for the presence of our species, Homo sapiens, outside Africa was found here in Israel. 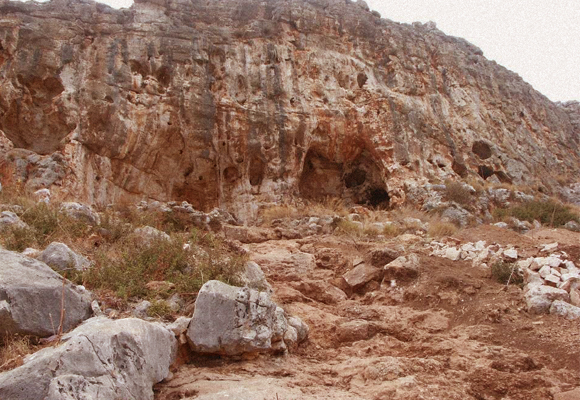 Up until now, the oldest evidence was discovered in Qafzeh Cave near Nazareth, where skeletons about 90 thousand years old were found, as well as in the cave of es-Skhul on Mt. Carmel, which was populated as early as 120 thousand years ago. Now researchers reveal that humans of our species lived in the Misliya Cave on Mt. Carmel at least 177 thousand years ago. According to these findings, Homo sapiens left Africa tens of thousands of years earlier than previously known. The study is based on a bone discovered in 2002. It includes part of the top jaw and cheek bone and all of the teeth on the left side of the mouth, from the incisor in the front, of which only the root remained, to the third molar in the back. Along with the bone, carved stone tools were also found in the same area of the cave. The researchers took a sample from one of the teeth and from the dental calculus accumulated on the teeth, and from the flint stone fragments found in proximity to the bone, and used different dating methods to identify the age of the bone. Their conclusion was that the owner of the bone lived 177-194 thousand years ago. The jawbone is thought to have belonged to a young man or woman. The layer in which the tools were found is presumably even more ancient, dating back 250 thousand years ago. There had been people outside of Africa during those periods, and even earlier, but these were not Homo sapiens and belonged to more ancient species. Humans that most likely belong to the Homo erectus species built camps in the Hula Valley nearly 800 thousand years ago. Neanderthals were present in South Europe about 400 thousand years ago, and remained there up until about 40 thousands years ago. Neanderthals or their close relatives were also found in Israel. Bones dating 120 thousand years ago were found in the Tabun Cave on Mt. Carmel, as well as signs of fire use, dating back 350 years ago. Following the Misliya Cave bone dating, the next question facing the researchers was: did it belong to a Neanderthal or to a human of our own species? If the former was correct, this would not have been considered a particularly dramatic discovery, as it is known that Neanderthals were in this region during that time. However, if the bone does belong to a Homo sapiens, it would be the earliest evidence of our species exiting Africa. Hershkovitz, Weinstein-Evron, and researchers from Europe and the United States applied innovative imaging techniques to examine the bone and teeth. Made of especially durable material, teeth often remain intact after the bones break and crumble, and so are prevalent in the fossil record. For this reason, a large portion of fossil research focuses on small changes in teeth throughout evolution, and we have a good idea of what Neanderthal teeth looked like and how they differed from our own. The size of the teeth, their shape and grooves, along with the shape of the skull itself, indicated that the bone came from a Homo sapiens with seemingly modern anatomy. “Every one of these features took us far from Neanderthals, and towards Homo sapiens,” said Weinstein-Evron to Davidson Online. The tools found along with the bone also indicate that there was someone new in town. The researchers examined over 60 thousand flint tools, with many still awaiting analysis. These tools were carved in quite a sophisticated manner, in a style known as “Levallois technique.” “This technique shows that those humans planned ahead what they intended to create from the material,” says Weinstein-Evron. “They also made efficient use of the materials at hand – preparing several tools from the same flint stone.” The people of Misliya made long and elegant blades, previously not seen in the Middle East. The researchers hypothesize that our species brought this technique with them from Africa. The new finding changes what we previously knew about the evolution of our species, since it means a group of humans began leaving Africa at a very early stage. Until recently, it was generally accepted that our species appeared only some 200 thousand years ago, but this has changed following the discovery in Morocco of Homo sapiens fossils determined to be 300 thousand years old. The anatomy of the jawbone found in Misliya is more modern than that of the fossils from Morocco, and it seems that they came from a Homo sapiens population, most likely from East or South Africa, very closely related to modern humans. Similarly, when the humans who resided in Misliya came here, they found a land populated with the people whose remains were found in the Tabun Cave and other locations. 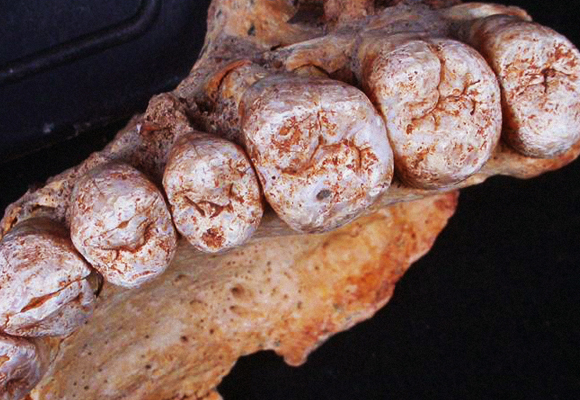 The researchers think that those seemingly modern humans who came from Africa interbred with the local population in Israel, and the fossils that were found in Qafzeh and es-Skhul Caves came from their combined descendants. Genetic studies on current-day humans showed that our ancestors left Africa later, about 60-70 thousand years ago. All people living outside of Africa originate from the same population that left the continent at that point in time, but some may have met other populations along the way. The dynasty of the humans of Misliya most likely disappeared at some point, without leaving a mark on human genetics.